In response to the Financiapocalypse, Nissan is offering 0% financing on five of their vehicles. Most interesting, and seemingly lost in the saved-by-zerogasm, is news of a lower-priced version of the 2009 Nissan Versa Sedan that, at an MSRP of $9,990, will be the cheapest new car in the USA. According to Automotive News, there will be an economy version of the 2009 Nissan Versa that will have an MSRP of $9,990, more than $2,000 off the base price of the lowest level model Versa. The cheapest cars currently are the 2009 Chevy Aveo ($12,625), 2008 Kia Rio ($12,145) and 2009 Hyundai Accent ($11,070), putting the Versa well below these competitive models. UPDATE: Nissan has revealed the details of their new Versa sedan, which explains how it will be the cheapest car in America. The new Versa sedan will be offered with a 1.6-liter DOHC four-cylinder engine as opposed to the 1.8-liter currently found in the Versa sedan and hatchback. This model will come equipped with a five-speed manual transmission that, combined with the new engine, will help it achieve 34 mpg highway. We assume there will also be some cutbacks inside, though we haven't seen the details of that yet. Update #2: From Nissan USA, we're hearing that when the new, cheaper Versa comes out on November 18th here you can expect to see some more changes in addition to the new transmission and engine: different seat cloth, 14-inch wheels w/ wheel covers and less chrome accents. As for the 0% financing, Nissan joins Toyota among Japanese automakers offering nil financing to get people to actually buy a car. The deal applies to the Rogue, Altima, Sentra, Versa and Murano (sorry Maxima buyers). The company will also offer attractive lease deals and extend their $399-a-month lease offer on the new Maxima. We like the Versa and for $9,999 it seems like a nicer choice than a Rio or an Aveo. Nissan Announces Lowest-Priced New Car in the U.S.* - New, 2009 Versa Sedan 1.6 Features $,9,990 MSRP, Excellent Fuel Economy, Design, Quality and Reliability; Available at Dealers November 18 - FRANKLIN, Tenn. (October 31, 2008) – Nissan North America, Inc. (NNA) today announced a new 2009 Nissan Versa Sedan 1.6 model, which features a starting Manufacturer's Suggested Retail Price (MSRP)* of $9,990* (excluding Destination and Handling). The new Versa focuses squarely on value and fuel economy, with its standard 107-horsepower DOHC 16-valve 1.6-liter inline 4-cylinder engine delivering responsive performance and a 34 mpg highway fuel economy rating (with the 5-speed manual transmission). 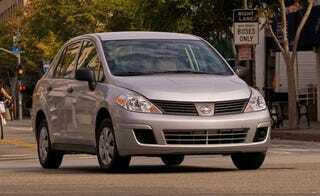 The Versa Sedan 1.6 goes on sale at Nissan dealers nationwide beginning November 18, 2008. "Starting under $10,000, this new Versa Sedan 1.6 has the lowest new-car MSRP in the United States," said Brian Carolin, senior vice president, Sales and Marketing, NNA. "It combines the low price of a used car with the dependability, high quality and full factory warranty of every new Nissan. It's our way of saying that in tough economic times, Nissan is here to help." Since its introduction in 2006, Nissan Versa has enjoyed strong appeal in the marketplace among buyers seeking fuel efficiency without sacrificing performance or roominess. Versa offers one of the highest standard horsepower/torque ratings and the largest interior in the entry-level segment – along with excellent quality, reliability and durability. The new high-value Versa Sedan 1.6 model features a smaller displacement 1.6-liter engine (versus the standard 1.8-liter), standard 5-speed manual transmission and simplified content. It is also available with a 4-speed automatic transmission. Fuel economy is rated at 26 mpg city/34 mpg highway with the 5-speed manual and 26 mpg city/33 mpg highway with the 4-speed automatic. "The new Versa Sedan 1.6 is another way in which Nissan is taking a leadership role in reassuring consumers that now is a great time to consider a new car," said Carolin. * Based on Manufacturer's Suggested Retail Price (MSRP) of $9,990 for the new, 2009 model year Versa 1.6 Sedan. Claim based on competitive MSRP's in the Lower-Small segment for new, model year 2009 vehicles. MSRP excludes applicable tax, title and license fees. Dealer sets actual price. Prices and specs are subject to change without notice. Destination and Handling $695.